According to the American Academy of Dermatology, about 15 million Americans suffer from eczema. With numbers like that, it’s likely a nail tech is going to encounter a client who has it. Eczema is a word we throw around easily, but it’s actually a generic term for many different skin conditions. A more accurate term for what we normally identify as eczema is “atopic dermatitis.” It’s accurate to call atopic dermatitis “eczema,” but it’s important to note that not all eczema is acute dermatitis. The eczema we’re discussing here appears as a red, swollen rash. Depending on the stage of the eczema, the rash could appear scaly or thick; it could appear moist or leak fluid; it may even contain small, raised bumps. Clients will complain of itching, a classic tell-tale indicator of eczema. Small rashes may appear around the eyes and lips, but most flare-ups are on the inside of elbows, the backs of the knees, or the underside of the hands. This form of eczema is called atopic dermatitis because the condition is believed to be the result of an allergen. An allergen is anything that triggers an allergic reaction. 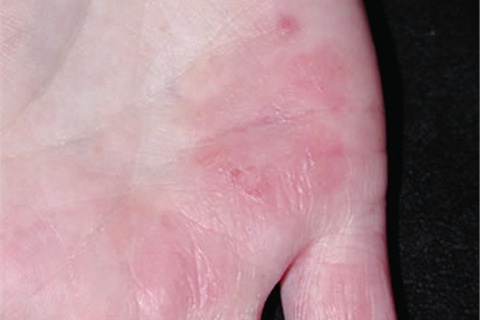 Often this form of eczema is hereditary; the client may have suffered from it since childhood. This isn’t always the case, however; it is possible to develop eczema as an adult. Allergens that trigger flare-ups of eczema can come from food, animals, the sun, the cold, or any number of environmental factors. Triggers are as unique as the person suffering. What’s important to remember is that during a flare-up, a person’s immune system is working overtime to try to combat a foreign substance. Often the immune system has been compromised prior to the exposure to the allergen, so it is too weak to provide adequate protection. Stress, illness, or exhaustion can weaken one’s immune system. Because of this, treatment of eczema works best with a two-prong approach. The first is to strengthen the body’s immune system through supplements. Healthy eating, regular exercise, and adequate rest also help build a healthy immune system, allowing the body to heal itself as its first line of defense. But even the healthiest among us still reacts to allergens, so the second approach is external. It’s important to pinpoint the source of the allergen and get rid of it, but sometimes it’s impossible to identify the trigger. In this case the only thing left to do is to treat the rash. Warm soaks, creams, light therapy, cotton material against the skin, and antihistamines are all useful treatments. Proper moisture is crucial to reduce the itch of eczema, so creams should be applied immediately after a warm soak, and the skin should be kept hydrated throughout the day. Creams can be natural, such as calendula cream, or they can be by prescription, such as cortisone or steroid creams. If it’s difficult for a client to manage her eczema and prevent flare-ups through topical creams, she may need more aggressive treatments, such as light therapy or medications that can modify the immune system. Though the condition is often heredity and is never contagious, techs can still be intimidated to touch a client’s hands when eczema is severe. Techs have a couple of options when they recognize eczema on the client’s hands or feet. First, they can choose to hold the client’s hands or feet as they would any other client, bravely touching the rash if necessary. A second option is to offer a gentle treatment during the service. Soak the client’s hands or feet in a warm bath. Apply a gentle, unscented lotion to her skin after the soak. Wrap her hands/ feet loosely in a cotton cloth, leaving the toes or fingernails exposed. Perform the service on the exposed digits, holding the towel when you need to move the hands and feet.